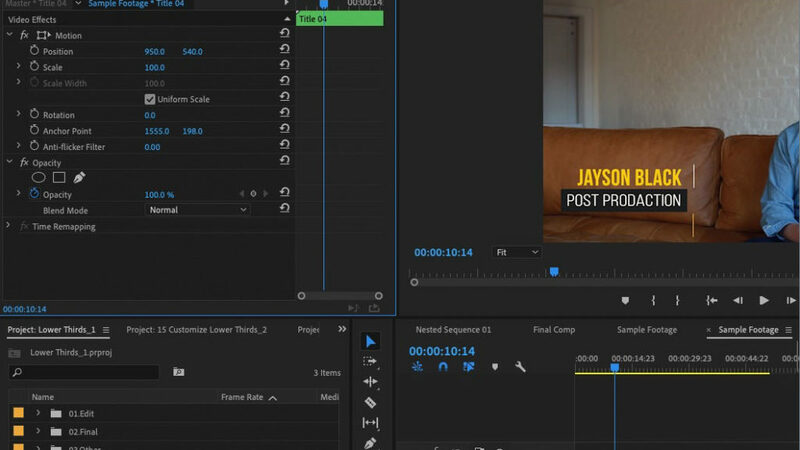 In this tutorial, we’ll walk through how to edit and animate Premiere Pro CC lower thirds. You’ll find out how to create them with no other apps needed, and learn about all about using templates in your video projects. Essentially, lower thirds are the perfect way to add some context to your production. Whether you’re introducing a speaker or setting a scene’s location, you’ll see lower thirds as an extra bit of detail that brings a video together. Make sure to watch the video tutorial below for a guided tour in editing these templates in Premiere Pro! 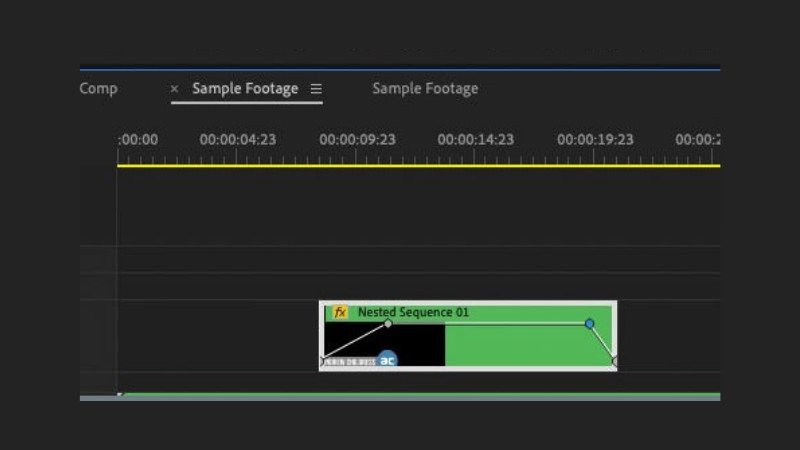 Even though Premiere’s primary focus is for sequencing, adjusting footage, and cutting together clips, it also has built-in graphics tools. That means that you can easily use Premiere Pro for lower thirds without the help of separate apps like After Effects or Apple Motion. 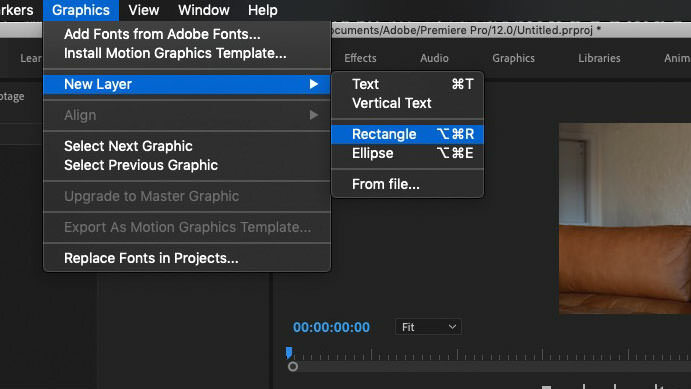 To get started in adding a lower third to a Premiere Pro project, you need to start by finding the Type tool. 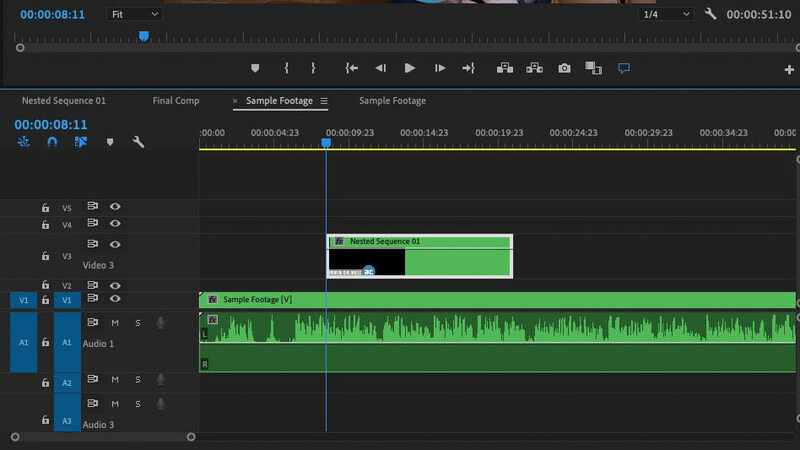 As you probably already know, Premiere Pro has some preset workspace setups that bring different tools into focus. When you start to add lower thirds, you can switch into the Effects workspace to bring the needed tools into the simplest arrangement. Find the Type tool at the bottom of the app and click on it. Alternatively, press the letter T on your keyboard. Now, click anywhere on the canvas to start adding it to your video. You’ll see a red box created, and you can start typing to add your text to the project. The default text might not be the font that you had in mind, or even in the proper position on the video. Luckily, it’s easy to customize the default text. First, let’s make sure that the text is in the proper position — the name of this type of graphic is a lower third, after all. That means that it should sit in the bottom third of your canvas. If the bottom third of your canvas just doesn’t work with text, you may want to consider putting it at the top — but the important part is getting it out of the way of your footage. Click on the Selection Tool (arrow above the Type Tool you used earlier), then click and drag to reposition the text into a better spot on the canvas. Now, you can tweak the font and size that you’re using for the text. On the left side of Premiere, you’ll see an Effect Controls panel with the settings to control the appearance of your text. Choose a new font, scale, and text color from the options you see. Most Premiere lower thirds overlays will benefit from a background or image as a complement to the text. That might serve as a way to include your logo, or simply a background box that will set your text apart from the video footage. You can also add a background rectangle behind the text. A simple, solid color rectangle can be more than enough to set your text off in the video. Go to the Graphics > New Layer > Rectangle to start drawing in your rectangle. Click and drag it on your canvas to add it. Now, you can control the rectangle’s color from the Effect Controls menu. Use the color chooser to change the rectangle. That’s it! You’ve set the stage perfectly for your lower third. Next, you might want to drop in an image. As you may already know, a logo in the form of a transparent PNG will work well here. In the example below, you’ll see the logo dragged onto the project panel and then placed it on the canvas. You can control the size and scale of the logo on the Effect Controls panel. Specifically, you can tweak the scale and position sliders to get the logo to the size and spot for the logo. To wrap this up, nest the text and image layers on the timeline so that they stay in lockstep while working with them. Shift-click on the two layers, then right click and nest them so that they stay grouped together. This will come in handy on the next step. Right now, you’re probably noticing that the lower third is pretty static: it stays on the canvas for the length that it’s set on the timeline. But you can also animate it so that the lower thirds shifts and changes over the course of the clip. First, notice on the timeline that the nested clip has a duration; that is, it’s on the timeline for a specific period of time. Just like any other clip, you can grab the handles and adjust that duration as needed to control how long the lower thirds is in your video. You may also want to change the opacity of a lower third. It helps to see the keyframes of a clip so that you can control how it changes over time. To do that, grab the handle below the track and drag it to increase the track size. With the track selected, start by decreasing the opacity to 0% on the Effect Controls panel. Now, pull the handle ahead on the timeline, to the part where you want to fade the lower third in. On the Effect Controls panel, add a keyframe by clicking the small diamond-shaped icon. Then, pull the opacity up to 100%. Pull the timeline ahead to another point on your timeline. Add another keyframe, then pull the timeline all the way to the end and add a final keyframe, pulling the opacity down to 0%. Now, you’ve created the fade-out effect. There are other controls that you can adjust from the Effect Controls panel. The concept is the same: add a keyframe, change a video setting, and adjust it from one keyframe to the next to animate your clip. Notice in the screenshot below that the four keyframes work together to fade in, then fade out the lower third. If you’ve put in the hard work of building your Premiere Pro lower thirds from scratch, you might want to save the style so that you can re-use it in future projects. You can do this by saving the style as a reusable template. First, start by saving your project under a new name. Then, work on deleting all of the elements except the lower third layers. That would include any other footage, text, or graphics. You want to reduce the file with just the essentials that you want to keep. Now, you can simply open this project up in the future and copy and paste the nested lower thirds layer over to your new project. Presto! There’s no sense in reinventing the wheel each time that you want to build Premiere Pro lower thirds graphics. 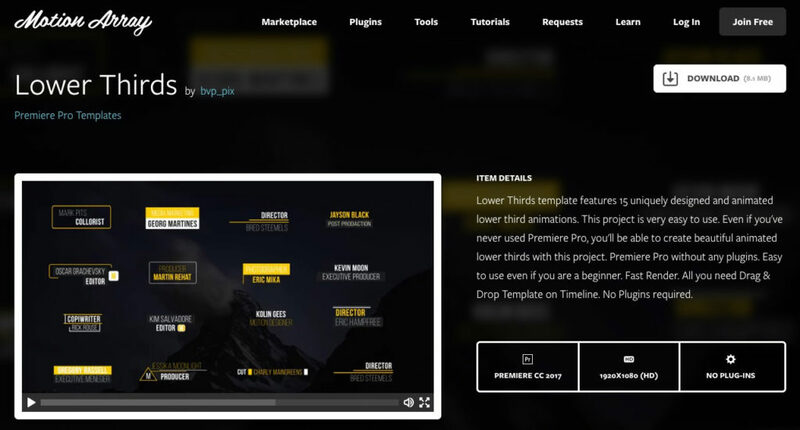 You can use a pre-built template to add incredible effects in less time than ever before. Even better, you’ll be able to access animations and styles from professional motion graphic designers. Even if you use a template, you don’t have to give up the ability to edit it and customize it to your liking. 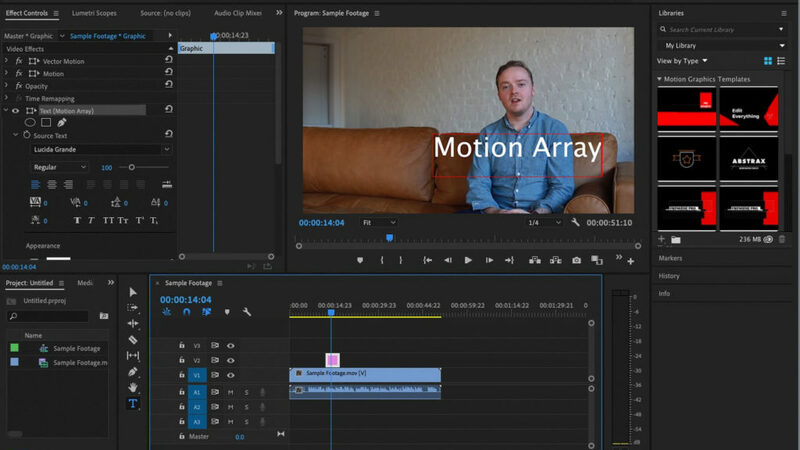 Start with a pre-built Premiere Pro template and tweak it with your specifics. 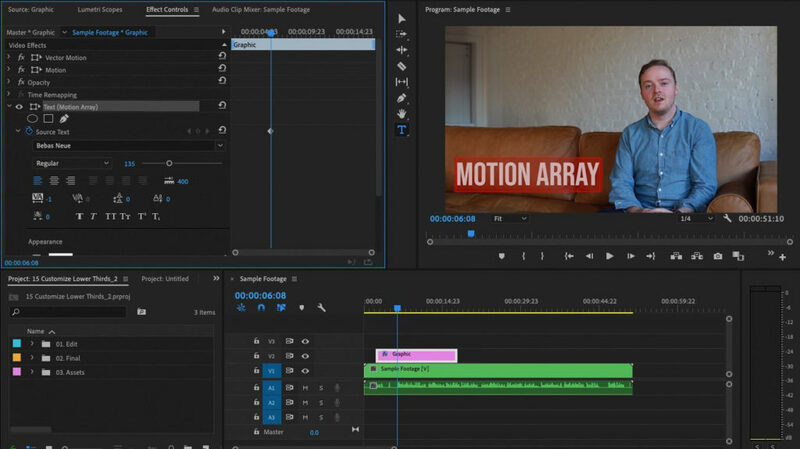 Motion Array has a deep library of Premiere Pro lower thirds templates that you can sample from. As part of a single subscription package, you’ll unlock tons of Premiere resources that save you time while designing. If you want to follow along using the template in this tutorial, download this Lower Thirds template from Motion Array. As you open up the file, it helps to preview the project. Notice that there are actually many lower thirds effects built into this single project. The best way to work with this is to choose one, then click on the layer on the timeline and copy it with Ctrl / Cmd + C.
Now, jump back to the project that you want to add this to, and press Ctrl / Cmd + V on the keyboard. You’ll see the lower thirds added to your video. You can move it around on the timeline to the perfect section of the video. Now, double click and drill through the layers until you get to the point that you can adjust the layer specifics. Type over text, update colors as you did earlier in the tutorial, and make any changes to match the style you have in mind. 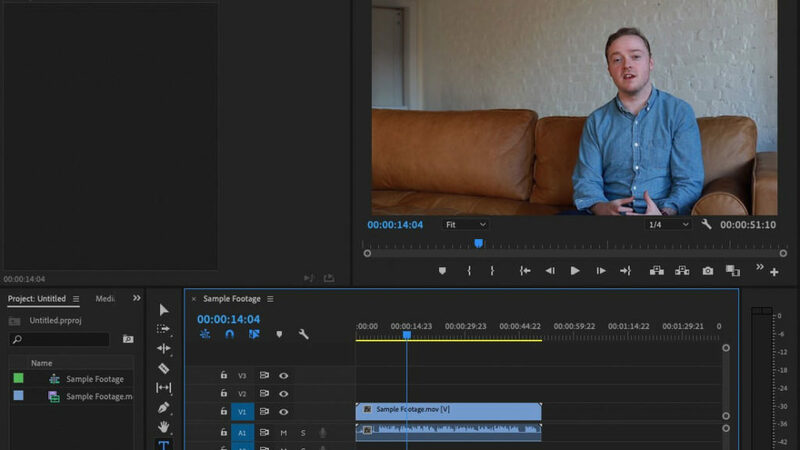 These layers are just as easy to edit as the ones we created from scratch. That’s it! It’s simple: just copy and paste the starter template, then adjust the specifics. No matter which option you choose, Premiere Pro lower thirds overlays are easy to add! Use the built-in options for simplicity, or a template that helps you add a bit of pizzazz to your Premiere Pro lower thirds. 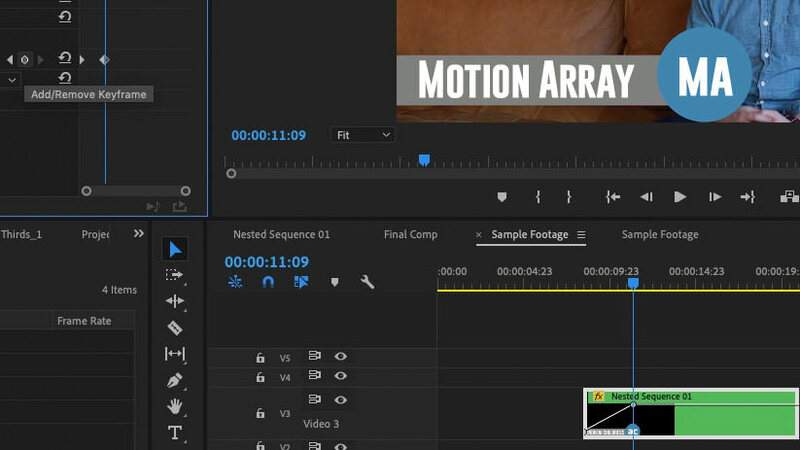 Don’t forget: Motion Array has a large library of lower thirds templates that you can use to spend less time editing and more time storytelling!